Netflix had notified Sony that the upcoming season, set for 2017, would be the show’s final outing on the platform. The streamer also cut the episode order from 13 episodes to 10, and slashed licensing fees on the show. Still, the two companies deny there are tensions between them. 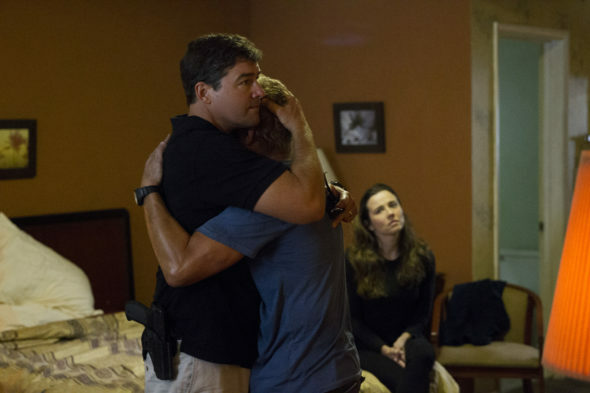 It’s unclear whether Sony will try and shop future seasons of Bloodline elsewhere. THR points out that cancellations are a rare occurrence for Netflix shows. Aside from Bloodline, the only other original series cancelled by Netflix are Norway crime drama Lilyhammer and Hemlock Grove, both of which were cancelled after their third seasons. Creators and executive producers Todd A. Kessler, Daniel Zelman and Glenn Kessler have said they had planned for five to six seasons, total. Still, they acknowledged that might be a difficult reach, since the Florida tax incentives ended. What do you think? Are you a fan of the Bloodline TV series? Do you think it should be cancelled or renewed after season three? Love the show just watched all of season 3. I want more. Wonderful show, how can they cancel? They take off the best shows and leave the crap on! GREAT show! I too was sad to hear the news of the cancelation, please do more seasons. I loved Bloodline and am quite sad it was canceled after 3 seasons. Please do 2 more seasons!!!! Love the show please reconsider. based on the final show – it was time to end – everybody was getting killed or jailed. the only way it should have ended is chuck, marisha and a cat with the suntimes showed up – there were a few moments of the old kyle chandler giving us that gary hobson bewildered look. PLEASE do not cancel this show!! LOVE IT!!! Only reason I actually subscribe to Netflix. Please reconsider more season!